Home » Blog Home » Rock the Vote! The midterm elections have been a trending story on newsfeeds across America for weeks. This is a great opportunity to start a conversation about voting and elections with all your students - at any age. With stories to start your discussions, interactive activities, and time for individual reflection, these lessons in politics will help your students become educated future voters. Elementary students will be interested to learn how voting works. Listen to a story like Otto Runs for President by Rosemary Wells, or Duck for President by Doreen Cronin (also available in Spanish), then create an interactive experience for them by giving them the power to vote for something. Candy ballots - How lucky that Election Day comes after Halloween - grab some sale candy or snacks and let your students vote on a treat! Illustrate the concept of group decision making by allowing students to vote on which treat all of them will receive. Encourage students to become educated voters by telling them about the characteristics of each treat - but withhold the name - so they focus on the properties. 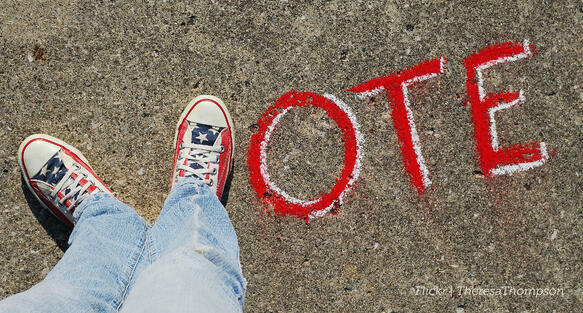 Explore the history of voting in the United States with Middle Schoolers. Listen to a title about what it took for various groups to win their right to vote. Understanding the sacrifices people made to get the right to vote will help students see the value in their future participation. Travel back in time to experience what voting was like at different points in our nation's history. Start with a radio broadcast from The Election of Thomas Jefferson or listen to Malcolm X's speech "The Ballot or the Bullet." Which of your students would have been eligible to vote at the time of those recordings? Choose selections from a story about women's suffrage like With Courage and Cloth by Ann Bausum to understand the fight for voting rights and what arguments were made for and against the 19th Amendment. High schoolers can discuss the role that voting and elections play in our nation's democracy, including specifics about how the midterm elections this year might influence the current political climate. Some students may already be eligible for voting or soon will be, and will be interested to learn how they can participate in the future of the nation when they exercise that right. Sweet Treats New and Improved Browsing!